Body, in Good Light. Erin Rodoni. Sixteen Rivers Press. San Francisco, California. 2017. "...bliss, like a memory, can be unearthed by scent." 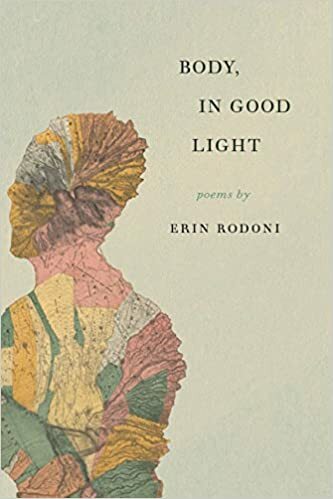 Erin Rodoni's Body, in Good Light has enough light to charm your eyes open wide but there will be tears enough before the end. Rodoni has poems built on sustained intensity but without any anxiety, passion without pontification. Today's book of poetry is a bit distracted today as our associate Odin is putting in his last days with us. Odin has been presented with a bigger and better playground and is unable to say no. We understand that and are proud of the work he has done here, we are sorry to see him go. Odin never talked all that much but we sure listened when he did. Body, in Good Light is just the sort of book Odin likes best, unapologetic intelligence, open-hearted wit and kindness. who lives with a man she'll never marry. I must lift it twice a day until I no longer can. orchid in a greenhouse in a snowed in city. Erin Rodoni talks about cancer and childbirth and chemotherapy and the impending death of a younger brother and when she is doing this she is covering some damned sad territory, sweet and profound. As a reader you'll feel compelled to turn to the next page, Rodoni keeps the iron under your feet suitably red. Today's book of poetry also wants to warn you. Rodoni moved us to real, running down the cheeks, tears more than once. As much of a crocodile as I can sometimes be those were real emotions running down my old face. when I died, and jewels worn closest to my skin. the mole your little finger doesn't brush? I only meant to say I can't forgive you. I'm not God, just a voice inside your head. about the heart? To do the things it tells you? to wash my dresses, leave them slapping on the line. behind the dresser, beneath the bed. the last moths of my scent. Our morning read was a tempered emotional affair this morning. We were all on edge because of Odin's bon voyage. Every time Rodoni crossed an emotional bridge one of us jumped out of our skin and to be pulled back from the ledge. Odin calmed us all down, as he always does, kissed everyone, left. A class act all the way. When I got back to my office there was a short note from Odin on my desk. He said "that Rodoni woman is built from strong stuff, first rate poetry from an intelligent woman's voice. Remember that you grew up under the care of a strong, intelligent woman. Stay the course." maps in the stars tick past without us until we are already ghosts. Erin Rodoni's Body, in Good Light is flat out excellent. You should give a copy to every woman you know. Wouldn't hurt any of the menfolk either. Erin Rodoni is the author of Body, in Good Light (Sixteen Rivers Press, 2017) and A Landscape for Loss, which won the 2016 Stevens Manuscript Prize sponsored by the National Federation of State Poetry Societies and is forthcoming later this year. Her work has appeared in Colorado Review, Cimarron Review, Drunken Boat, Ninth Letter, Spoon River Poetry Review, Tupelo Quarterly, and The Adroit Journal, among others. Her poems have also been included in the Best New Poets anthology, featured on Verse Daily, nominated for a Pushcart Prize, and honored with an Intro Journals Award from the Association of Writers and Writing programs. She currently lives in the San Francisco Bay Area with her husband and two young daughters.